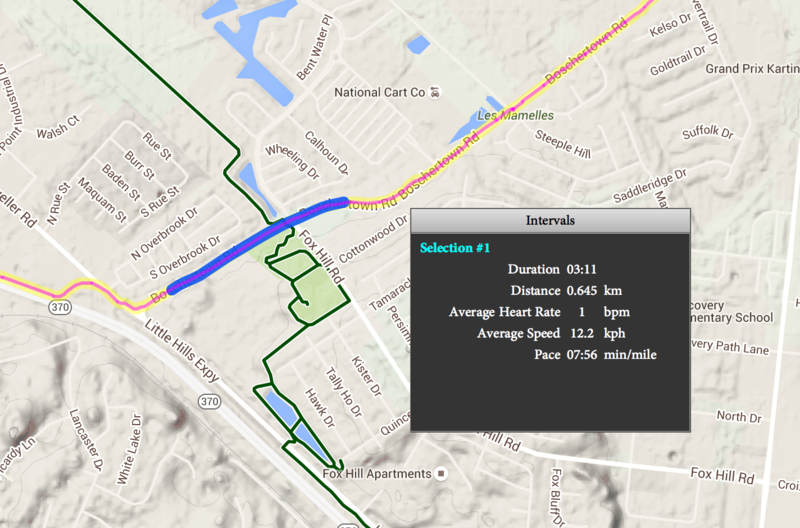 In that 11th mile there is an uphill section with a maximum speed of 1:26/mile or 42mph. 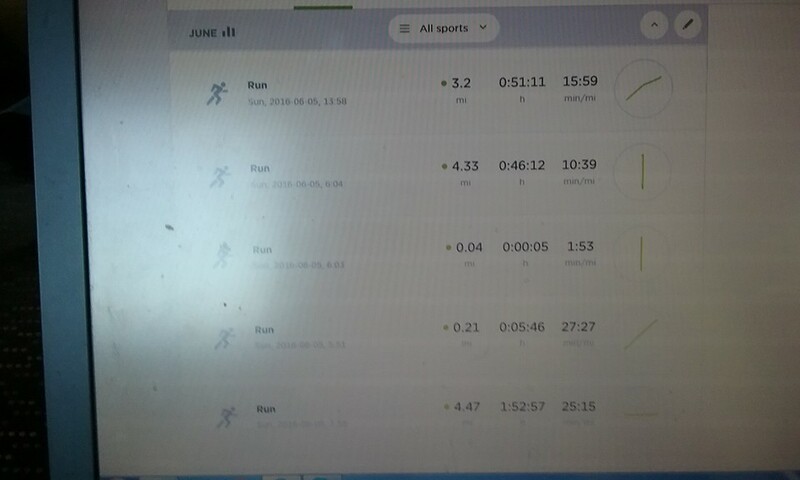 Using the un-timestamped gpx downloads from Joanna's account, I found that "week1 - joanna/Night_Run (15).gpx" had 18382 points, which exactly matches this run of 5:06:21. We should be able to target the others the same way. A 400m effort in 46s?!? Nice, Hiro. I critiqued the opening of the book early in the thread. RY's data he posted in mapmyrun and linked in Facebook contradict info in his book about the initial 3 marathons in 3 significant ways: (1) mapmyrun order was 3:19, 3:28, 4:07 so he got slower not faster; (2) book says route was loops in Richmond Park, but mapmyrun shows point to point from Twickenham to Regents Park, which then rules out Eva as a witness to his initial marathon as the book claims; and (3) mapmyrun says it was Day 2 when he ran 2 marathons in a day, not Day 1 as the book claims. I point this out simply to say RY contradicts himself, quite obviously. I think the book exaggerated the claims that were already an exaggeration in the mapmyrun data. My interest was in regard to some of the training information he presented. Specifically the last two images posted here: http://imgur.com/a/9JWxv. Why? Because the same material shows up here: http://www.brightonhalfmaratho...-anderson/ . Without context we cant know for sure if he attributes it or not. That is why we really need to get a copy of the book. - The names of Nick Anderson and Katie Hiscock aren't mentioned in the book (according to Google Books search). - The Brighton marathon is mentioned once (just a mention it's one of his favourites). Excellent catch. It looks like the "Weeks 24 - 16" section is the closest match, but even then it looks like the author tweaked some of the language. I'm not really sure what to make of this. It seems like a lot of this generic running advice is copied all around the internet, who knows if the "serpentine" running website was the original author or not. Same goes for our other find, although that seems to have more clear authorship information. looks like RY and team got a little carried away. That looks like a dangerous section of road, probably trying to hurry and get past it. Finally, Robbie has broken his silence. I bring you, "Robert Young Reacts." His FB likes seem to continue to increase every day at a static rate - has he got some kind of auto-like generator on FB as he does with Twitter? In addition to GPS uploaded from bikes, they have GPS taken and uploaded from a vehicle. About 6 seconds at 35mph. A miscommunication most likely. One guy starts the watch thinking they are starting a "run", the driver isn't on the same page and takes off, the guy with the watch turns it off but doesn't delete it. There's a 2nd section like this in the GPX data but was deleted from strava. Huh, weird. What is the 2nd section like this? I wonder why they were off of their route (http://i.imgur.com/V11uEts.png)? I dunno, nothing they do makes sense. Maybe getting in extra GPS miles to cover gaps, hoping Guinness would just look at total miles and not make sure it was all continuous. The 2nd section is actually after the Geezers arrive. June 13 at 18:07 they log 9 seconds at 40 mph going the wrong direction. A few minutes later, at 18:12, a normal run starts at about that same location going the right direction. It was their first run after a 6 hour break. Most likely the 40mph segment was accidentally recorded while driving back to their starting point for the day. Anomalies like that are interesting, but don't really tell us anything other than they aren't very careful. Does anyone have the capability to check how long the watch stopped prior to the carwash CCTV in Emporia in the strava data (near mile 4.3 I believe)? According to their paces, the tracker and watch appear be together after starting at the same point from a long break. They appear to stay together up until about 0.6 mi west of the CCTV, where we have the final tracker point before the increment where the RV drives past the camera. The data actually make it look like the watch gets to that point before the RV, but I think that's just an artifact of the 12 min increments of the tracker. The watch passes the CCTV about 8 min after that point 0.6 mi west, and the RV would likely make it about 3-4 min after that point. If RY didn't break for about 5 minutes before the CCTV, it doesn't seem like he's the person in the infamous yeti video. There's also a buttonhook in the strava data just 0.2 mi west of the CCTV, right before the watch drops to walking pace. If that is RY getting out of the RV, the stopping break would have to occur right there and be maybe 7+ minutes for him to get separated from the RV by 9 minutes. I think that's pretty normal behaviour for a Facebook page with 10s of thousands of 'likes' (real or not). It will grow gradually and organically. If we'd have been watching it when he bought the fake likes, we would have seen very large jumps. He gained his first 12,000 likes in 14 days (857 per day), which is vastly higher rate of growth compared to now. If you think that only running brings out the fakes you'd be wrong. Here's an article about an Indian couple who 'summited' Mt. Everest with faked data, deleted FB posts, etc. Damn, I throw out an idea, go to bed, and when I wake up, someone has already run with it and done the job. You guys are awesome. If only my real job worked like that! So are you going through and adding timestamps to all of them now? Would it be quicker to just run them all through a script that uses the same dummy start-time, upload them to Strava, let the LR community crowdsource the real start times based on their locations, and then re-run the script with the actual start times? And the case against them. He is huffing and puffing and it honestly looks like a tempo to half-marathon type effort. That's a really good find. Each individual GPX point has a timestamp. At the 1st tracker point, 23:14:25, Rob is with the RV. At the 2nd tracker point, 23:26:25, Rob is with the RV and starts to walk. At the 3rd tracker point, 23:38:23, Rob arrives 2min after the RV at 23:40:31.
most likely the CCTV is just about 5min off. The only real non-moving times is about a minute after the 15-minute RV-riding section ends. Then it's ~5 minutes of walking, ~10 of running, ~5 walking, with the buttonhook not obviously occurring near anything RV-related (maybe he saw something shiny on the ground?) Then walking steadily, past the car wash, for some 35 minutes before stopping for a minute at a house's front door, and shortly after, 10 minutes of stoppage at Mary's Place. I wanted to run for a couple miles with the guy running across America, since I saw he was coming very near Lebo. I saw he was within 10 miles of Lebo, so I got in my car to find exactly how far away he was. I started driving west on old highway 50 from Lebo, and eventually passed an RV going east with an American flag on the back corner of the vehicle. I recognized that as the runner's RV, but I did not see anyone running. I thought the runner might have another support vehicle further back, so I kept driving. After a couple of miles, I checked his live tracking, and saw that the runner was indeed east of me. I took a screenshot of where the map said he was, then drove down the road. When I got close to the RV, I started filming, and still did not see a runner. They did not have hazard lights until I got somewhat close behind them. I decided to get out of my car at the next intersection to stand on the south side of the RV to get a better view. The next intersection was a main road, so I turned toward Lebo, and parked a block down the road. I ran back to old highway 50 and started going toward the RV. I didn't want them to stop before I got to them, so I ran up next to a house, and watched as the RV drove by with no runner in sight. I also took a screenshot of the map and took a video of the RV driving by. After it drove by, I ran into the highway, turned on my headlamp to strobe mode, and started running behind the RV. It was driving running speed, so I was making progress, but they saw my light and stopped. Someone got out of the passenger side of the RV, but when I got closer they got back in, and the RV drove off too fast for me to follow on foot. I ran back to my car, then drove to the highway. By that time, the RV had returned to the intersection of Fauna road and old highway 50. Someone was standing outside the RV, but I just drove past it heading east. I parked on the south side of the next intersection, and again, waited for the RV to pass. While waiting, I looked at the live tracking, and saw where the RV had driven away, and then come back, so I took a screenshot of that. I waited in my car for a few more minutes, and as the RV approached, I took another screenshot, and then another video* as the RV drove by once again without anyone running beside it. *note: I turned my camera from vertical to horizontal around the two minute mark, so you have to turn your head 90 degrees to the left to see the RV driving by (or understand it is driving from bottom of the screen to the top). I realize it is dark, so the videos donâ€™t show a whole lot, but here are some points to consider. 1)	The highway he was running on has no shoulder, so he likely would have been running in front of the RV in order to use its lights, and to keep safe from cars. Cars behind would see the RV and avoid it, while cars in front would see him in the headlights, as well as the RV. Rob does not appear in the headlights of any of my videos. If he did choose to run in the grass on the side of the road, I expect he would use a headlamp or flashlight, but again, there is no sign of a light other than those on the RV. The first video shows he was not running behind the RV, or in the oncoming traffic lane. 2)	In my first video, you can also see the hazard lights of the RV turn on as I drive up from behind. It seems like support vehicles usually drive with their hazard lights on the whole time, but it makes sense that this group wouldnâ€™t if they are trying to avoid drawing attention to themselves. 3)	Also, see his recent blog post where Nancy Bennett attempted to run with him at night, and we unable to see him until the vehicle stopped (allowing him to exit the vehicle). It would be interesting to get her input on her experience compared to mine. The blog explains that Rob was just on the other side of the RV, but my multiple attempts allowed me to see all sides of the RV to ensure I did not just miss him on the other side (unless he is running circles around the RV). I am convinced that Robert is not completing all of the distance on foot, and I understand my screenshots and videos cannot definitively prove it, but I think it at least warrants a very close inspection of his attempt if he is to be awarded recognition for this. Maybe other people have an experience and/or evidence that also indicates he is not running the whole distance. Forgot the quote. I meant... What ever came of this? Did he cheat? nah ... no cheating going on. just a misunderstanding of what "running" means. I ran with Rob Young during his world record run and he was awesomely fast and a really nice guy. You meanies should leave him alone! He wasn't running for his own achievement but for the children, raising millions of pounds for children's charities.